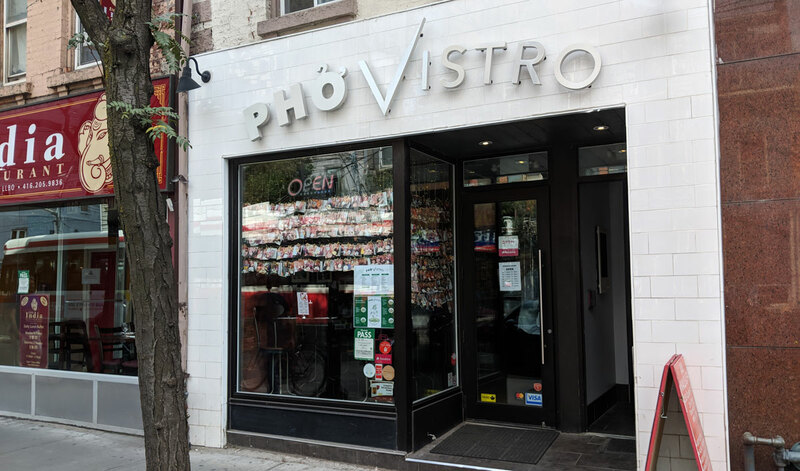 The pho at Pho Vistro was fine. There wasn’t anything particularly wrong with it, and I didn’t dislike eating it. But it made no real impression on me; my biggest takeaway is that it was food and I ate it. It wasn’t memorable in any particular way. 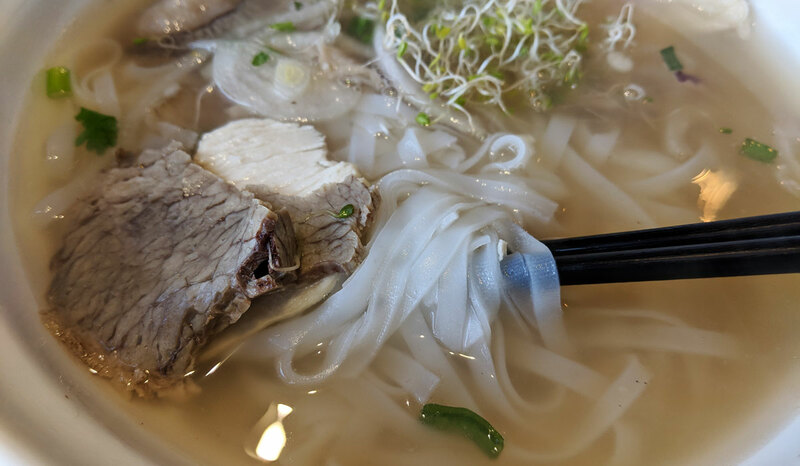 They have a few different varieties of pho on the menu; I ordered the restaurant’s namesake dish, which features beef and chicken. 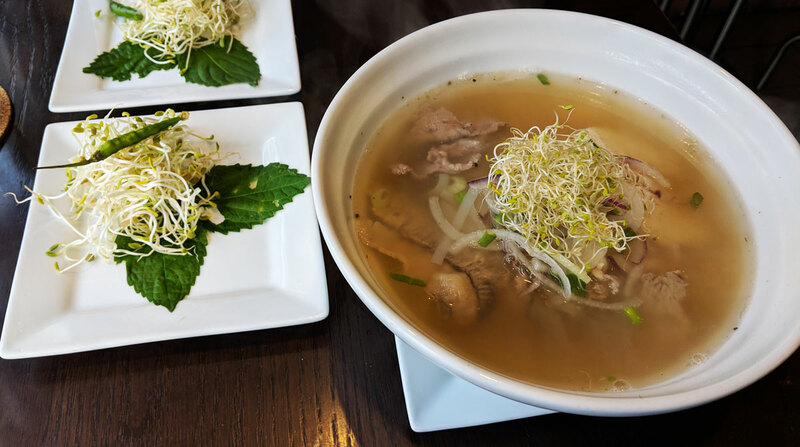 The broth had a nice, clean chicken flavour, but almost none of the distinctive spicing you expect from a good bowl of pho. They have a couple of bottles of sauce on the table that add a nice dose of spice and zestiness; these are absolutely essential. On its own, the soup is seriously bland. The slices of chicken and beef are okay, but they all had a vaguely leftovery flavour, and they’re all a bit tough. The broad rice noodles are what you’d expect. They’re good. It all adds up to a very inoffensive meal that I can’t imagine anyone getting too excited over. 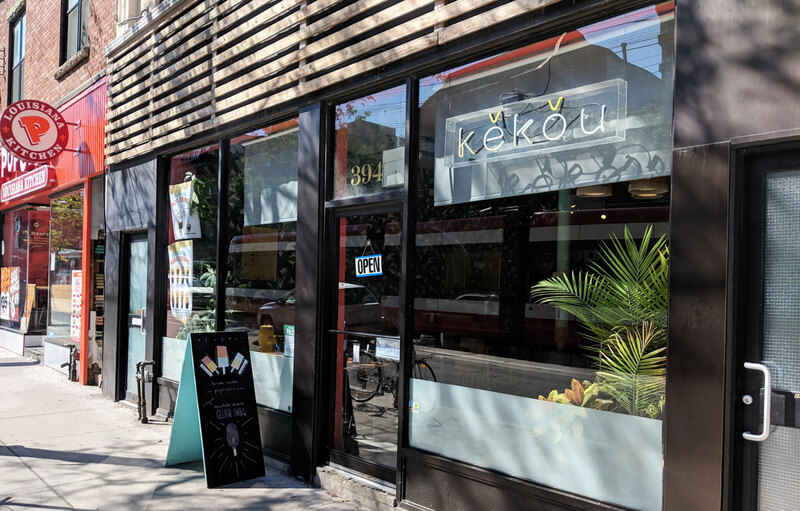 Though ice cream and gelato joints serving Asian-inspired flavours seem to be popping up on an almost weekly basis, I’m pretty sure Kekou is the OG. It might not be the pioneer in the city, but it was definitely one of the first. They have a variety of unique flavours like black sesame, Vietnamese coffee, and durian (and they must also be doing other things with durian, because the place kinda reeks of the stuff). I went with rosewater pistachio, and the flavour was superb. 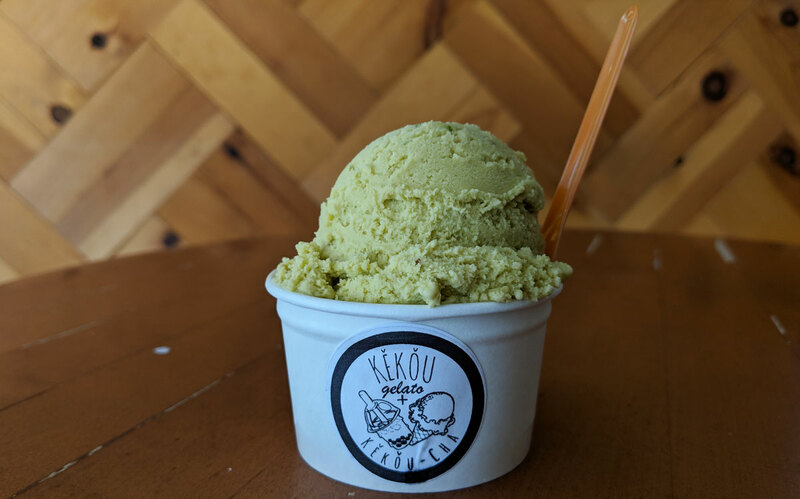 The balance between the nutty pistachio and the fragrant rosewater was just right; neither flavour overwhelmed the other, and they complimented each other perfectly. The texture, however, was a bit of an issue. It wasn’t icy, but it had a thin mouthfeel and a distinct lack of creaminess that was unsatisfying. 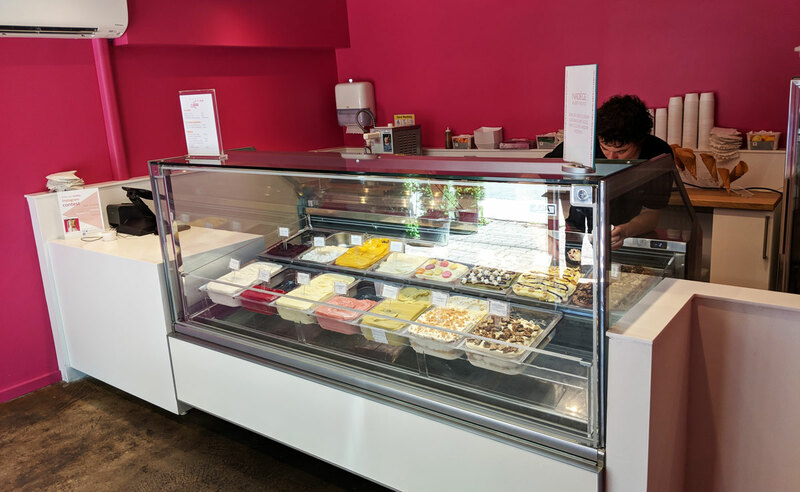 The funny thing is, they actually have a sign up in the store explaining that the thin texture is intentional — it is, they claim, a side-effect of the gelato’s lack of stabilizers. 2) Even if this is true — that it’s impossible to make creamy gelato without the use of stabilizers, and that every luxuriously creamy gelato I’ve ever had (both here and in Italy) used some form of chemical magic for its rich texture — then maybe stabilizers are just part of making high quality gelato? Again, I’m skeptical that this is the case, but I’m sure that making truly great gelato is a skill that takes years to master. If your gelato-making know-how isn’t advanced enough to make it creamy without using stabilizers, then here’s an idea: use stabilizers. Is the ability to smugly claim that your gelato is stabilizer-free really worth selling a subpar product? It’s not a huge deal — and I’ve certainly had worse — but the fact that they’re coming right out and admitting that they’re selling inferior gelato on purpose is a little bit frustrating. 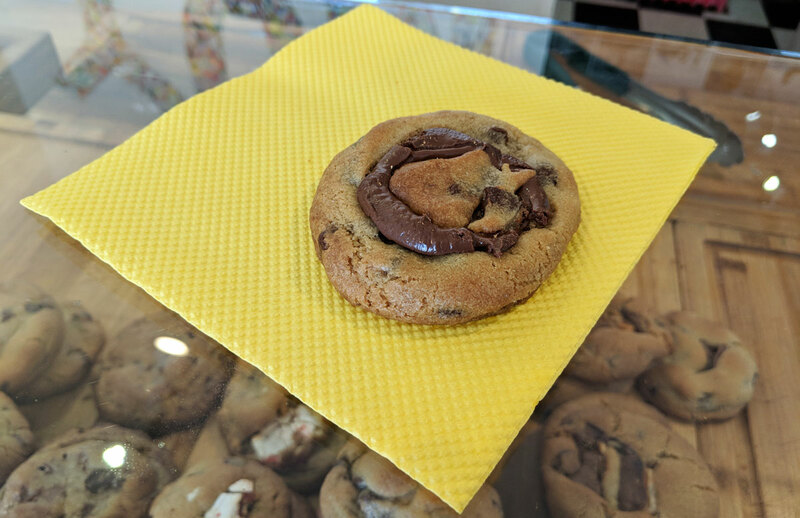 Though there are a handful of places to get delicious, freshly-baked cookies in the GTA, there are very few dedicated cookie shops. It’s actually kind of baffling; everybody loves cookies, don’t they? 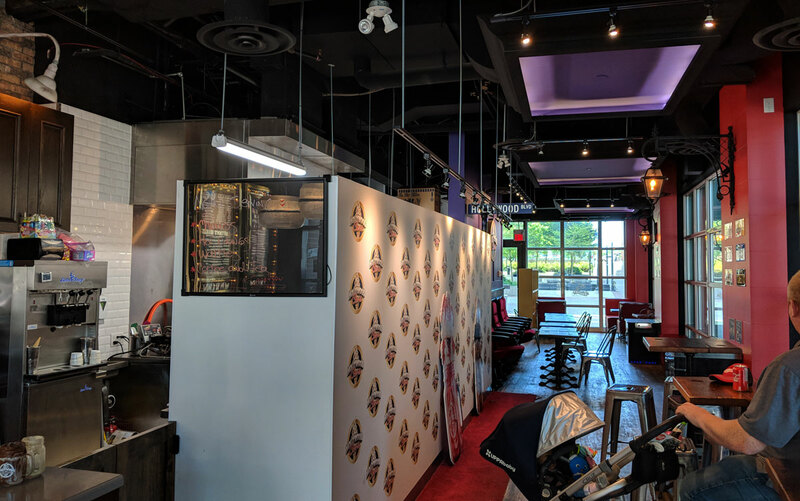 There’s Felix & Norton in Markham, and apparently there’s a place called Robyn’s Cookies that I literally just discovered on Google moments ago, and… that’s about it. 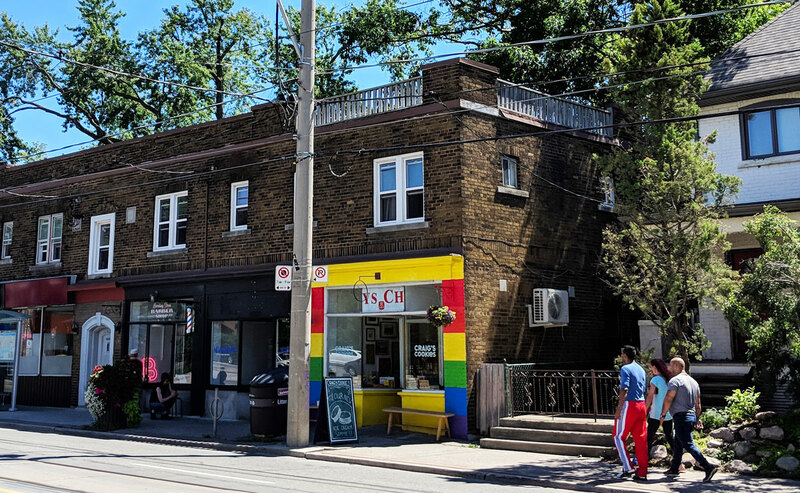 There used to be Moo Milk Bar near the Beaches; they had amazing cookies, but alas, they went under. 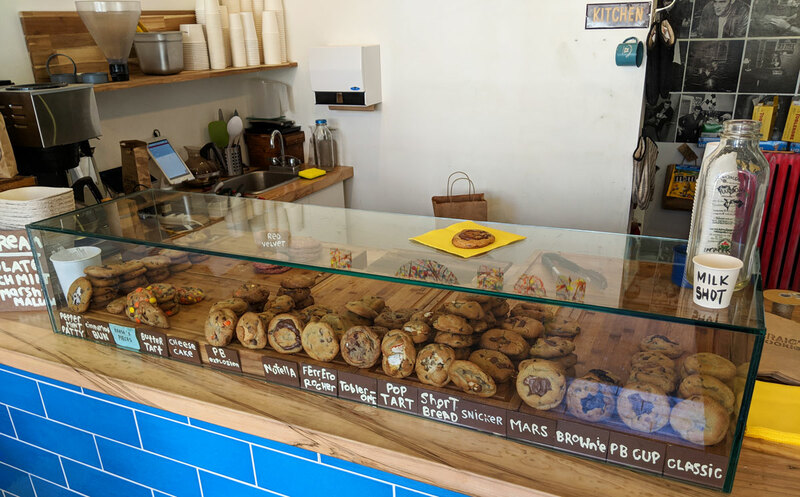 Thankfully, there’s a new contender in Toronto’s very un-crowded cookie shop field: Craig’s Cookies. They sell nothing but cookies and ice cream cookie sandwiches. I have a lot of respect for a place that does one thing, and does it well. And man, does Craig’s Cookies ever do it well. 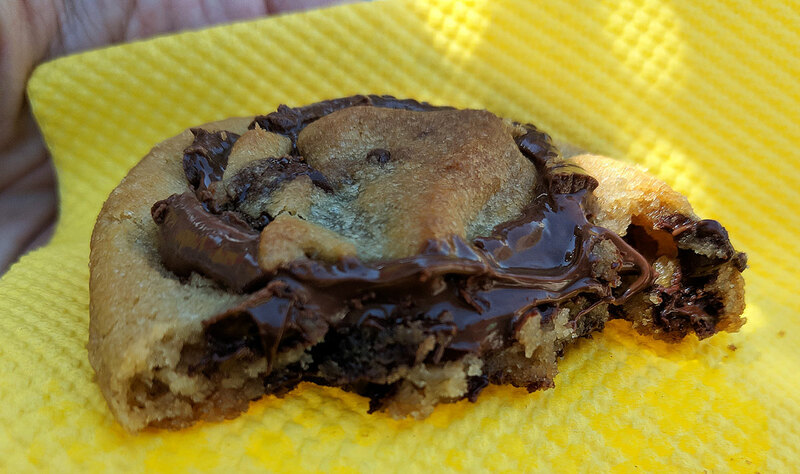 They have a whole bunch of really delicious-looking cookies; I went with Nutella, which is a standard chocolate chip cookie with a whole bunch of Nutella in the middle. Pretty much anything with that much Nutella is going to be delicious, but I was actually shocked at how good the cookie itself was. It had a perfect flavour, a great crispy/chewy contrast, and enough chocolate chips to give it that chocolatey hit, but not so many that it’s all you taste. It also had a great balance of salt, which I think is the secret with a cookie like this. You need a little bit of salt to help balance out the cookie’s sweetness, and Craig’s nails this. There’s just enough salt for it to do its job, but not so much that it stands out. Perfection. 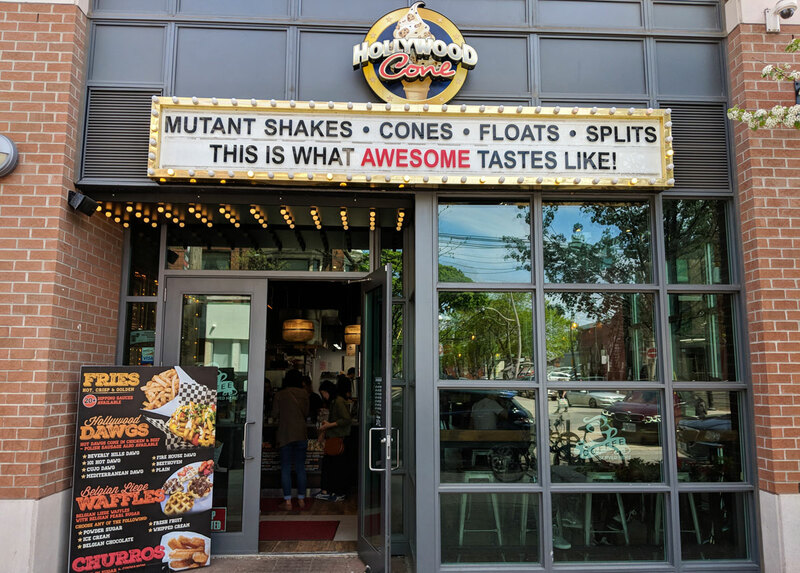 Hollywood Cone is basically a superior version of Sweet Jesus — they have a similar selection of social-media-friendly cones, along with other Instagram-bait creations like elaborate milkshakes topped with entire doughnuts or slices of pie. The quality of the ice cream itself is a solid upgrade over Sweet Jesus. And yet the place seems to be struggling to attract customers — go figure. On this particular day, I was actually intending to get a scoop from Bang Bang, but the line-up was intense, even by their standards. Meanwhile, Hollywood Cone (which is just a few blocks away) was a ghost town. 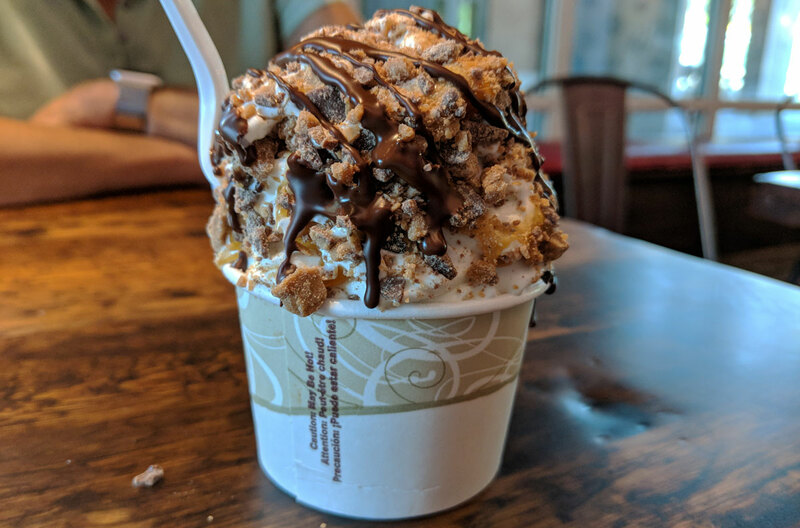 I ordered the Salted Caramel Skor (well, technically I ordered something else and they gave me the wrong thing — but I couldn’t be bothered to correct them), which comes topped with Skor bits, salted caramel sauce, and a chocolate drizzle. It’s not bad at all. The sauces were middle-of-the-road, but the real attraction here is the ice cream. It’s super creamy and rich, and it lacks the artificial sweetness that you find in lesser soft serve. It’s really, really good. 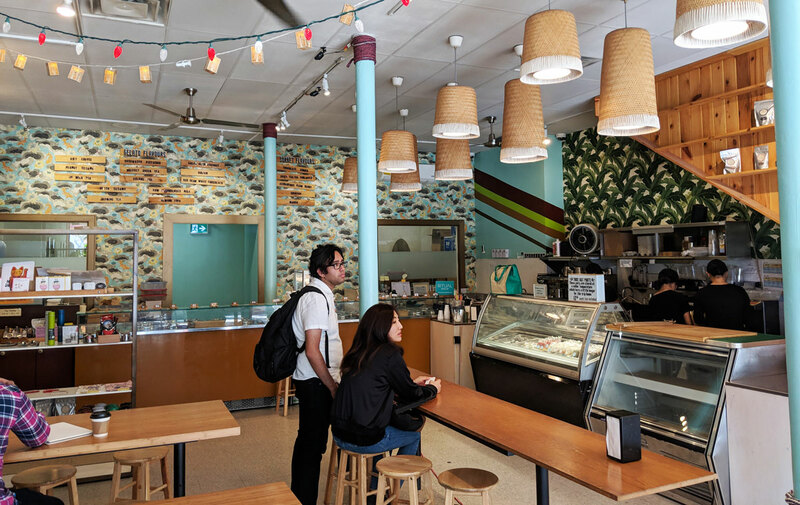 Like at Sweet Jesus, their creations are designed to be Instagram-friendly cones instead of the sundaes they’re clearly meant to be, so the toppings run out pretty quickly. But unlike at Sweet Jesus, the quality of the ice cream is so good that you don’t particularly mind. 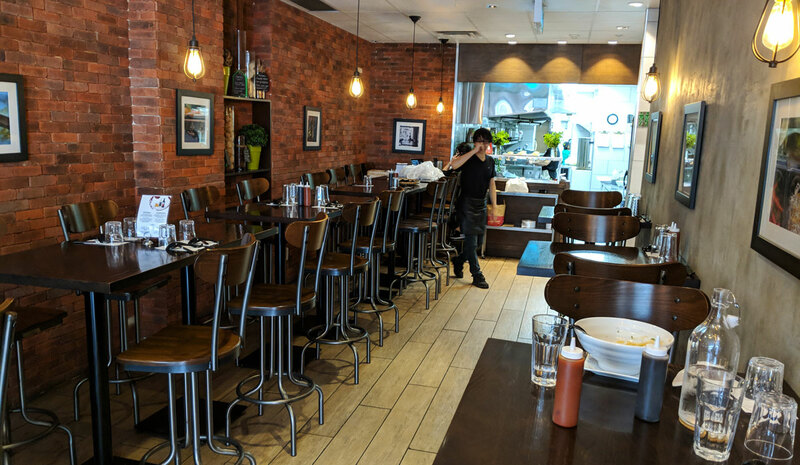 It’s odd that the place isn’t doing better than it is, though the aforementioned service issues don’t help, nor does the fact that the place is weirdly dirty and dark, with an atmosphere that feels more like a dive bar than an ice cream shop. Though I feel like the pastries at Nadege have gone a bit downhill since their expansion to multiple locations, I still like the place. And I can’t say no to their latest addition: ice cream (I can never say no to ice cream. Never). 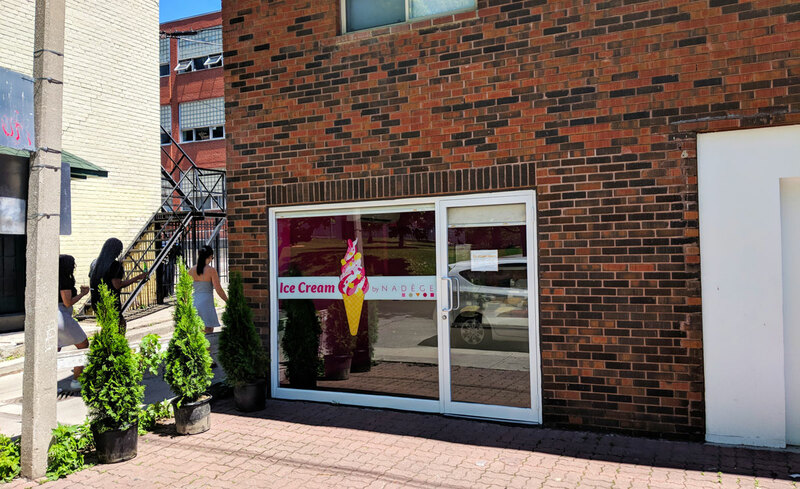 They have a small ice cream shop right next to their original Queen Street location, serving classic scooped ice cream (not to be confused with the soft serve they’ve had for a while now). It’s good, though the ice cream itself is nothing too special. It’s a bit thin; it’s not nearly as rich or as creamy as it should be. But the flavour makes up for it. It’s got a delightfully subtle sweetness, with refreshing swirls of tart blackberry sauce and big cakey chunks. 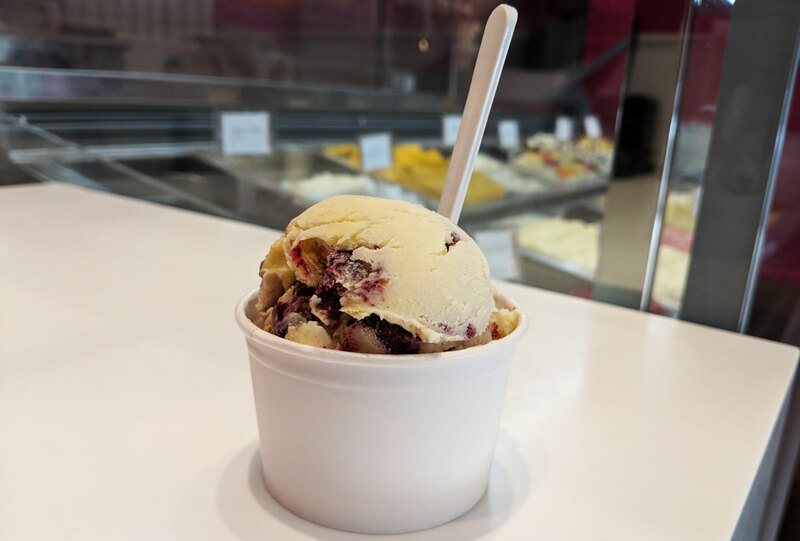 I wish the blackberry sauce weren’t so icy and that the chunks weren’t so generous (my scoop was something like fifty percent biscuit and fifty percent ice cream), but I still enjoyed it. I’m keen to go back, if only to try out some of the other flavours; they were almost all really unique.